The Bay of Banderas is rapidly becoming the new Florida for many Canadian snowbirds. If you’ve never heard of the Bay of Banderas, it’s a huge bay - 43 kilometres long - on the Pacific Coast of Mexico with Puerto Vallarta at its centre. Puerto Vallarta was first made famous by Richard Burton and Elizabeth Taylor, who fell in love here while making The Night of the Iguana - and who purchased the house they had rented and often returned to for romantic getaways. Many Hollywood celebrities visited here in the Sixties and Puerto Vallarta was suddenly “on the map”. Today, the entire bay area has been developed both north and south of Puerto Vallarta to create a haven for tourists and Snowbirds alike. The former fishing villages in the area are very much still there but they are surrounded by 4 and 5 star resorts, golf courses and condos along the never-ending beach. The bay faces west so wherever you are, chances are you will be looking at the sunset every evening. The area is served by the Puerto Vallarta international airport and there are connections to most parts of Canada in the winter months. You’ll find a large contingent of Canadians in this part of Mexico who spend part or all of the winter here, primarily in the following towns. 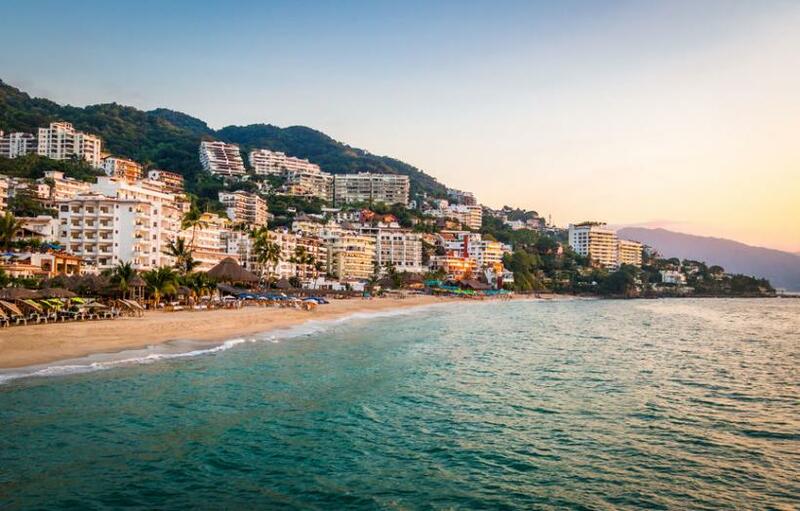 Puerto Vallarta today is a world-class resort town with an established center bustling with shops, boutiques, galleries, restaurants, bars and a lengthy promenade - the Malecon - along the waterfront. Puerto Vallarta has spread its wings to the north and south with many deluxe and moderate resort hotels, as well as modestly priced rental apartments to suit all budgets. There are many up-market condo developments for those interested in buying a vacation property, which are often also available as rentals. And there’s a wonderful marina that’s home to hotels condos and some impressive yachts. Living in Mexico is relatively inexpensive and supermarkets offer wonderful fresh produce - not to mention inexpensive wine and beer. Snowbirds will find plenty to do in Puerto Vallarta, including championship golf courses, watersports of all kinds, sailing, tennis, fishing, beach walking and swimming - and the town is very LGBTQ friendly. Nuevo Vallarta occupies 5 kilometres of what was largely virgin beach just a few decades ago, located just north of Puerto Vallarta. It is known for its golf courses, marina and long, wide sandy beaches. There are small villages nearby including the sleepy village of Sayulita, a favourite for surfing. Nuevo Vallarta is only 20 minutes from the Puerto Vallarta International Airport and is nestled between the Pacific and the Sierra de Vallejo mountains. Despite all of the planned resorts and golf courses, the area isn’t spoiled and holds the 2018 Earth Check Silver Certification. There are lots of activities including beach sports, golf, scuba diving, surfing, yoga classes, gyms and tennis. You’ll also some world-class resort spas where that offer many different types of treatments. Two golf courses of note in the area are the challenging El Tigre golf course and the Jack Nicklaus Vidanta golf course. Nuevo Vallarta Nayarit is home to two marinas - Nuevo Vallarta Marina and Paradise Village Marina - the latter can accommodate close to 500 boats docked in a protected natural area alongside luxurious properties. Continuing north from Puerto Vallarta and Nuevo Vallarta lies the popular Bucerias, a sizeable resort town and former fishing village that sees many Canadian Snowbirds arrive during the winter months. It’s a typical Mexican seaside town with cobblestone streets and a main square that is perfect for strolling and exploring. There are lots of restaurants, shops and services for visitors. Bucerias has 5 miles of lovely Pacific beaches to the north and south along its shores. It’s another favourite with Canadian snowbirds who first discovered the area in the 80s. Today, Canadians make up most of the seasonal snowbird contingent in Bucerias, residing primarily in low rise condos. Bucerias is like Puerto Vallarta was several decades ago. Punta Mita is a large point at the top of Banderas Bay. It’s now a private peninsula that is home to some very exclusive, deluxe hotels including the Four Seasons, the St. Regis and Casa Aramara Punta Mita - along with some fabulous private villas. Punta Mita is surrounded on three sides by a rugged coastline and many beaches and coves. There is an annual technology conference of billionaire entrepreneurs and venture capitalists held here. So, yes, this is a very exclusive resort. But just outside Punta Mita there are more moderately priced hotels and condo rentals available at the northern end of Banderas Bay. This area is more isolated and about an hour’s drive from Puerto Vallarta’s centre. Mismaloya is actually where much of the Night of the Iguana was filmed. It is a beautiful, isolated cove surrounded by lush vegetation. As a former fishing village, it’s a mecca for visitors drawn to its gorgeous beach, al fresco restaurants and great seafood. Snowbirds will find apartments, condos and houses to rent here. Local activities include the nearby marine reserve Los Arcos National Park, a great spot to snorkel and dive where you can see manta rays and turtles. You can also visit Vallarta Zoo to see many species, including monkeys. About 10 miles south of Puerto Vallarta you’ll find the quaint fishing village of Boca de Tomatlan - or “Boca” as it is known locally. You can get there by car, bus or by water taxi. Boca lies on quite a deep inlet at the mouth of the Horcones River and is not far from the Vallarta Botanical Gardens. There are multiple accommodation options here including B&B’s, villas and apartments for rent. Yelapa is a beach town at the southernmost part of the Bay of Banderas and is an unspoiled cove. The easiest way to get there is by boat, which makes it all the more appealing, as does its beautiful beach. You can find rooms to rent and enjoy fresh seafood for lunch every day. This is truly the old, unspoiled Mexico.